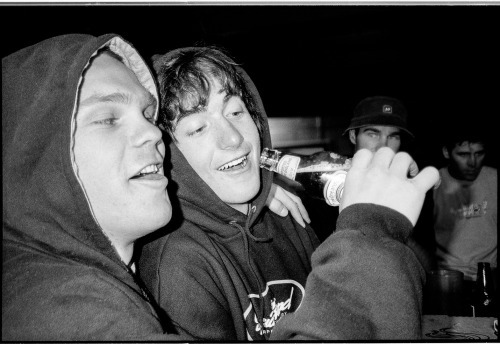 An underage Nate Bozung getting introduced to his first beer by the instagator Mikey LeBlanc. 2000. Big Bear, CA during the first Nixon Jib Fest. Last week I published my first book, Incidental Contact, with the help of friends at Book Book Press in Salt Lake City. There are copies still available after the release party that was had at Fice Gallery. It’s a self-published 68 pager, b/w, printed with soy-based ink on a RisoGraph printer. Hand scored, folded, bound and trimmed without losing only 3 serious paper cuts and all fingers still accounted for. The images are a collection of candid photos of people, places and even pets in situations of silliness, semi-seriousness and even some sadness. I’ve been collecting these shots for 10 years in the places I’ve lived and traveled. It should be worth mentioning that since most people know me from my work in snowboarding photography, this is not a snowboarding book. This is a small run 150, each is numbered. 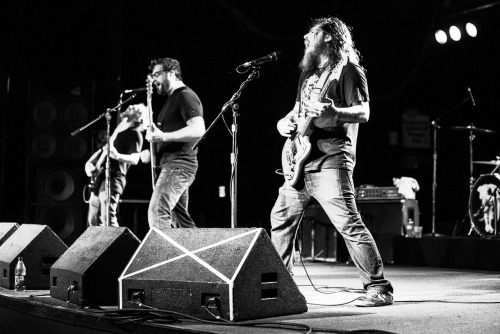 Limited supplies…. $15 includes shipping anywhere in the US (click PayPal button below)…. International shipping available, please’ email me your address first so I can calculate and I’ll get back to you with a total. UPDATE: My stock of the first edition is gone. Thanks for all the support. There are still some copies available at Fice Gallery in Salt Lake. You can contact them here about gettting one. 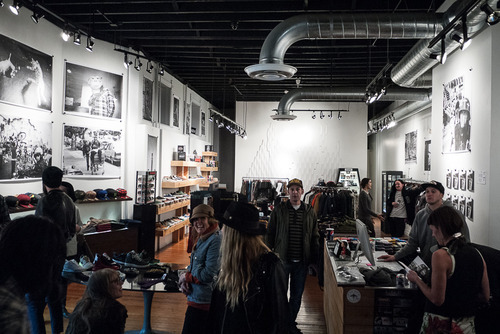 Last Friday was a release party of my first book, called Incidental Contact at Fice Gallery in Salt Lake City, Utah. 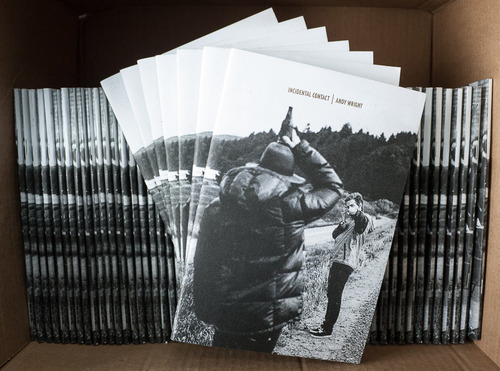 The book is a self-published effort, 68 pages, and includes not a single snowboarding image. I printed some of my favorite images from the book to display at Fice for the month. 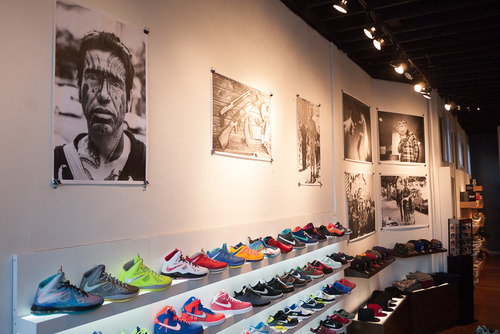 If you’re in Salt Lake in that time frame, please go check it out. Fice also has books for sale. Thanks to Laura and Corey for the opportunity. I’m pretty excited to be heading to Whistler, BC as a finalist in the Tellus Pro Photographer Showdown. I’ll be showing a career-spanning 9 minute slideshow. Tickets are hard to come by, but if you’re in the area I hope to see you there. “We mustn’t forget – a magician’s props, like a photographer’s choice of camera, are only part of the illusion created. When the rabbit is pulled from the hat, its color or breed is irrelevant. What’s important is the magician’s ability to artfully make the rabbit appear and ultimately evoke astonishment from the audience. In photography, the equivalent is taking an image that evokes strong feelings, regardless of which device captured the picture or its nostalgic hue." A friend of mine, Per Hampus, just sent me this link to a project he’s working on called TIME ZERO, which is the another Polaroid story . This one about the people trying to save it from extinction, an nearly impossible task and justly named THE IMPOSSIBLE PROJECT. Interesting little video with a quick history of Polaroid. Can’t wait to get a copy of this book. Here’s a behind the scenes look of day I spent shooting in Sapporo, Japan last winter with Johnnie Paxson. It’s still a little too early for me to be posting the photos from this day, they should be appearing in snowboarding magazines worldwide soon…. Although I’m not necessarily an advocate of any particular medium in the Film vs. Digital debate (I prefer to focus on end results, not the means of getting there) this litte 3 minute Sci-Fi inspired video definitely provides a glimpse into a world that could quite easily become a reality someday. I got to shoot photos at Music Fest NW in Portland last week and it was, once again, an incredible 5-day music marathon. Here’s some of my favorite shots from what is the best week in Portland each summer. This was one of more incredible days for me in recent memory to be on the snow again with Tim Ostler. This guy is an inspiring human beyond words and has absolutely no quit in him. Relevant yesterday, today and tomorrow. 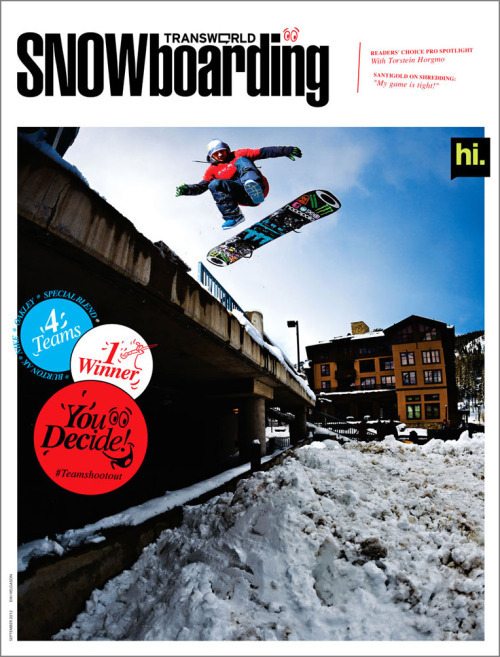 My photo of Eiki Helgason made the cover of the Sept. 2012 Transworld Snowboarding. This is 1 of 4 covers for that issue, and there is an online contest for the readers to decide which one is the best. Please go to http://snowboarding.transworld.net/1000180038/team-shoot-out/oakley-team-shoot-out-cover-2012/ and help me out by liking the photo. Thanks. Borge Andersen ran a world class film processing lab in Salt Lake City. His specialty was E-6 processing (slide film) and they were so good at it that there were photographers from all over the US – including New York and LA – that would rather take their chances FedEx'ing their shot film to Borge than process it locally. You could always count on Borge to make whatever you shot look it’s best. For years I would see him several times a week (sometimes several times a day) running back and forth from the lab. When digital photography took over it was definitely weird to have that relationship with Borge and his Lab absent. I always felt guilty driving by the shop and not stopping in. They managed to survive, somehow, since the digital revolution, mostly with printing services, but during the heyday it was ground zero for photographers in Utah, and even those passing through town. Rarely was there a visit to the lab that I didn’t bump in to a peer. Thanks for everything Borge! 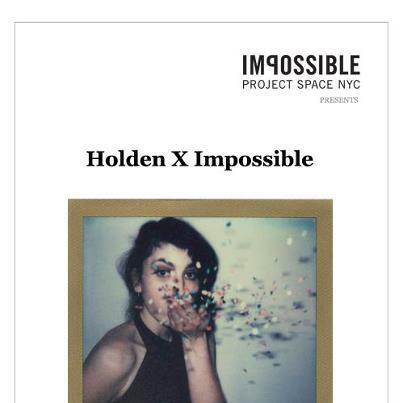 I’m honored to have been selected as a shooter for the Impossible Project Holden Outerwear collaboration. For those not familiar, the Impossible Project is producing polaroid film for the SX70 series cameras, which was discontinued years ago. Check out the images I produced as well as the other works from the über-talented list of shooters. I spend a lot of time standing alongside snowboarding filmers, and there’s a lot of guys doing amazing work, but no one captures the soul of snowboarding better than this guy. No one has been in the game longer either. His passion hasn’t dwindled one bit in all those years. And he still shoots film. Every year Transworld Snowboarding Business keeps track of the exposure each rider, brand and photographer gets throughout the year’s publication cycle in North American print magazines. I quite pleased to learn that I came out on top for the 2nd year in a row. This is my 5th title in the 8 years the Exposure Meter has been around. iphone photos won 3rd place for the prestigious International Picutres of the Year competition. As you can imagine this story has created quite a stir in the photo community, mostly outrage. 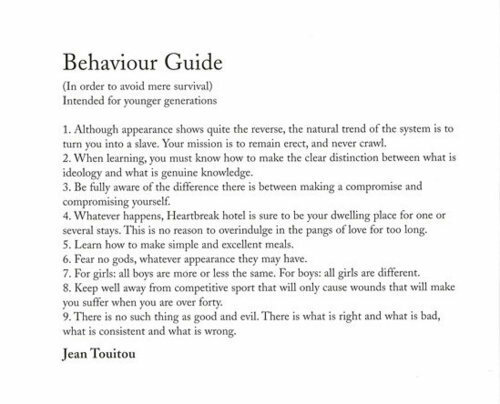 I tend to side side with the author, who makes great arguments for the validity of these images. At the end of the day, every camera is a means of producing a physical manifestation of what your mind sees. I’m as concerned with the process of getting there as I am with the chef’s actions behind closed doors preparing my favorite meal. I just want something that’s good to chew on, albeit mentally in this case. I first met Ian back in the summer of 1992 at Mt. Hood His crew from Tahoe was camping near my crew from Salt Lake. There wasn’t very many snowboarders back then so you pretty much became friends with anyone who you met that rode. We are all trying to be pro snowboarders back then. He took a lot farther than I ever did, but somehow we both ended up behind the camera after a few years in front of it. We both became senior photographers at Transworld around the the same time before he stepped down to work for exclusively for Forum. Ian never seemed satisfied with just getting the shot, he was always experimenting the different films, processing, cameras, props, etc… His photo of Cameron Pierce from the first Transworld Team Shootout jumping over a forest fire is possibly the greatest snowboarding photo ever taken that didn’t make the cover. His shoots always look like huge productions to the sense that I don’t think he’s satisfied with a photo unless it either almost killed him physically or mentally or both. Even on a good day I’m sure he’s only marginally happy with his work, always thinking of ways to improve. This guy has passion for photography and the process like no one I’ve ever met. His camera truck (aka Time Machine) is history in the making. Photography students will be reading about Ian and his work in classrooms someday. He is a living legend of photography and I’m glad to call him a friend. My first skate ad just came out this month. Stoked! Austin Smith and Bryan Fox started a movement –if you could call it that– to remind people to stay hydrated (and perhaps second guess drinking that energy beverage).